So personally I was looking for a step by step to do this but only found pieces here and there. So hopefully this will help someone out. This was done on OSX but Sublime is cross platform so I am sure it will work on any platform. Why Sublime Text? Multiple cursors. Once you start using it you can't live without it. Open the root of your Unity project in Sublime. There should be a .sln file there. to the sublime-project file you just created. ProjectName is the .sln file in your root directory which will be you project's name of course. Note there is also a -csharp.sln file. It is not that one. Thanks for this! Intellisense was the only thing preventing me from using Sublime exclusively, and while I was investigating getting it working a while back, I got sidetracked. OnCollisionEnter2D, Update, Start, FixedUpdate and so on. What should I do to have this kind of autocompletion? Well not even Mono provides that right? So the best approach would be snippets. You will have to write them yourself or look in the package control if you can find any. Yes, you're right. Mono doesn't provide it but I wanted to be sure that I am not missing something here... Thank for your fast reply! Hey loet, thanks for you tutorial! I've tried a number of different solutions. Installing different versions of Monodevelop, installing all the stuff in different order, reinstalling, double and triple checking all the settings, but I can't figure out what the problem might be. 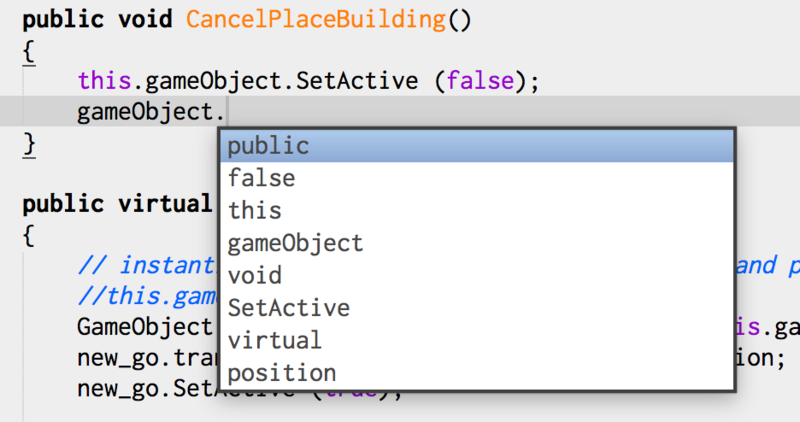 I get some sort of autocomplete, but it doesn't look like Intellisense to me. Using other tutorials step 4 and 5 above is not made as clear. I would assume the problem is somewhere there. That is where I struggled initially and also though that Intellisense wasn't installed properly. Thanks so much. :D Worked perfectly. It's a bit easier to forget about VS now. Although it will take some getting used to making OSX my main dev OS.